Escape your office and bring your lunch for another season of Musical Interludes at the Library. Join us on Wednesdays from 12:15 to 12:45 throughout the month of February. Join the Friends of the Grande Prairie Public Library for their annual Silent Auction in the Library from Tuesday, February 19th to Saturday, March 15th, 2007. Exciting items including a miniature figurine from the Trail of Painted Ponies and a hockey stick autographed by the Edmonton Oilers will be auctioned to support the purchase of furnishings and equipment for the new Library due to open in 2009. Have you been wanting to work on your motorcycle or dirt bike in preparation for the riding season, but don’t have a manual? Look no further than your Library. Bundled with your Library membership, you have access to over 30 online research tools. New for 2008 is the Small Engine Repair Reference Center, the Home Improvement Reference Center, World Book Online and World Book Kids. Need to debrief after school? Have fun learning about the concept and origin of Art Trading Cards and enjoy making your own to exchange with your fellow students at the end of this workshop. For ages 11 – 14. Register by calling (780) 532-3580 ext 226. February 13 & 14, 2008 will be Food for Fines Days at the Grande Prairie Public Library. The Library will waive fines on one overdue item for each non-perishable food item you bring. The Library will be accepting non-perishable food items and toiletries for the Salvation Army Food Bank. Do you have fines on five overdue items? Then bring five food items! Don't have fines? Feel free to bring a donation anyway! Call the Library at (780) 532-3580 for details. Wow! The response to my post asking if GP should ban single use shopping bags has been pretty impressive. I have two prior posts on the subject, the first one is here and this is the second one that was posted last week. This is probably the issue that I have received the most comments on the whole time I've been running the blog. As of today there are 20 comments on the post and 61 votes have been cast in the poll. One that I hadn't considered was security. "How does a store know that the person walking out with a bag full of goods went through the till if they don't have a store bag?" Good one, I'm sure there are answers to that but it would need to be considered, or at least recognized. Another was on people from out of town. "What about people who are new to the city or tourists or out of town shoppers? They won't know to come with their own bag." I don't know - what about these kinds of people? I would guess they just have to buck up the extra loonie for a bag they can reuse when they get home. 1. I know that web polls like this aren't scientific and 61 votes is probably not a large enough sample to be an accurate representation of the whole city. In the first post I mentioned that Leaf Rapids, Manitoba was going ahead with this. I've visited their site and below you'll find their bylaw. I'm really enjoying the discussion, keep it going. Have a read of the bylaw and think about if something like this could work in GP. Let me know what you think! In order to assist other municipalities that might want to introduce similar legislation, Leaf Rapids is providing the wording to By-Law # 462. The By-Law was passed at 12:01 AM on March 22, 2007. Being a By-Law of the Town of Leaf Rapids for the establishment of Single Use Plastic Shopping Bags. 1. THAT the Town of Leaf Rapids will be Single Use Plastic Shopping Bag free effective April 2, 2007. 2. THAT retailers in the Town of Leaf Rapids will not be permitted to give away or sell plastic shopping bags that are intended for single use. 3. THAT a person who contravenes this By-Law of the Town of Leaf Rapids is guilty of an offence and is liable on summary conviction of a fine of not more than $1000.00. 4. THAT where a contravention continues for more than one day, the person is guilty of a separate offence for each day it continues. 5. THAT on passing of this By-Law, By-Law No. 457 is hereby rescinded. 6. DONE AND PASSED as a By-Law of the Town of Leaf Rapids at the Townsite of Leaf Rapids, in the Province of Manitoba, this 22nd day of March, 2007, A.D. It's time for the Library Update! Here's what's going on at the GPPL, courtesy Library Director Laurie Harrison. Thanks Laurie! The Children's Library is hosting a draw for tickets to the Grande Prairie Live Theatre Alice in Wonderland play. To qualify participants must borrow a classic, fantasy or fairy tale library book. The theatre has donated the tickets. Working with the theatre is a new partnership that holds the prospect of working together on exciting programs. The Grande Prairie Public Library's 20th Annual Clem & Muriel Collins Writing Contest will be accepting submissions beginning Wednesday, January 2, 2008. The theme is Travel. The contest features five categories (Grades 1-3, Grades 4-6, Grades 7-9, Grades 10-12, and Adult) all with great cash prizes. The contest closes Monday, March 31 at 9:00 p.m. Need to debrief after school? Join us for a Cartooning Workshop. For ages 11 – 14. Register by calling (780) 532-3580 ext 226. Date: Wednesday, January 16 Time: 3:45 p.m. – 5:15 p.m.
National Family Literacy Day is Sunday, January 27, 2008. Join the Library for reading fun from 2:00 - 3:00 pm and meet some special guests! The annual ‘Turn off the TV’ Contest runs from January 19 to January 27. Visit the Children’s Library to pick up an entry form. The next session of the Grande Prairie Public Library's Book Club will start at 7:15 pm on Thursday, January 17 in the Library's Spencer Room. We will be discussing The Girls by Lori Lansens. New members are welcome. For more information call Anna at 532-3580 ext 234. Come in your pajamas and bring teddy for a half-hour of bedtime stories. Tuesdays from 7:00 -7:30 p.m.
January 15 - February 5 For more information please call (780) 532-3580 ext 226. "Bill, I thought you might enjoy this link. 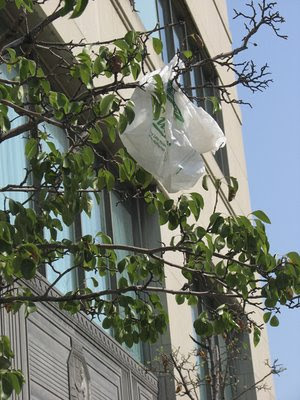 Essentially China is banning free plastic bags commencing June 1, 2008. I know San Francisco has also done this. More cities will follow suit. Wouldn't it be something if Grande Prairie did this as well, beating Edmonton and Calgary to the punch?? There is no real downside. "Thanks for the note and don't every worry about sending anything along! Any ideas are appreciated, even the seemingly little ones. I actually posted about this on my blog quite a while ago. I like the idea but to be honest I'm just not sure about pushing it forward here. What do you think, would most people be in favour? The only downside I see is that it can be viewed as council adding costs to businesses. Kind of like if I told you that your office couldn't use BIC pens anymore. I know, I know that's not a great analogy but you know what I mean. The two comments I received on the previous post were both positive about banning these single use bags, and now this email. So, I'm asking you all out there - what do you think, is this something the city of GP should pursue? Let me know what you think by voting and leaving comments. The poll will close at 12:00am February 1st. "The letter accuses me of interfering with and misappropriating Ed Stelmach’s personality (I’m really not sure where Ed Stelmach’s personality is, but I certainly didn’t take it)." Here's the media attention this has attracted. 1. It doesn't have to cost a lot to get broad media attention for your cause (you just have to be smart). Just in case anyone out there any big ideas - I already own billgiven.ca, .com, .net and .org ... they all point to this site. Oh, by the way, I'm reading Wikinomics by Don Tapscott and Anthony D. Williams right now. It's subtitle is "How Mass Collaboration Changes Everything"
City of Kelowna considering community bonds to support financing for the Mission Recreation Park Aquatic Centre. My Comment: This is interesting, unfortunately I don't know if this is possible for AB municipalities, we'll have to check into it. Also of note - Kelowna is getting a Flow Rider. Town of Penhold receives $6 Million from the Province of AB and The Government of Canada for New Multiplex Facility. My Comment: Wow! Hmmmm, a $6 million dollar investment in our Aquatics Centre would be nice! Province of BC and The Government of Canada Contribute $2 Million to Upgrade and Expand Chetwynd & District Multiplex. This morning at the Protective Services committee the City's Fire Master Plan study was presented. I didn't get to attend but was at the presentation of the draft plan back in June. The report has confirmed what we believed waaaay back before the election when we told the county that we could not guarantee service beyond the current contract. We knew the local fire service was under sized for our region and that with out a significant investment we couldn't in good faith continue serving the areas outside the city. With the expansion of both the County and City there just were not the personnel or equipment to go on doing it. Eventually we did come to an agreement with the county to renew the contract we had for service outside the city. This has seen an increase in the amount they contribute to the service (up to $1.6m in 2009 &$1.9m in 2010) and I think we'll see a move towards some kind of integrated regional fire service over the next two years. But in the mean time (and knowing that we have additional money coming in) Council has approved expanding the city fire service over the next three years with a new hall somewhere on the west side of the city. This will give us halls in the north, south and west and good coverage across the region. This doesn't come cheap though - below is what is approved in the City's 2008 - 2010 budget for setting up that third fire hall. Thanks to Deputy Chief Lemieux for the concise data. 50th Anniversary Celebrations Coming Soon! Valentine’s Day is a special day to demonstrate affection to others. In Grande Prairie this year, it will also be a reason to embrace our community. Fifty years ago on that date, Grande Prairie received its charter, officially making it a city. The 50th Anniversary committee will announce events it has funded on that date as well as details of other celebrations and contests. The City’s charter arrived in Grande Prairie on Feb. 14, 1958 on horseback. Henry McCullough, a district guide and hunter, sponsored by the Chamber of Commerce, completed a nine-day trek from Edmonton with the document. He was met at the outskirts of the community by the RCMP and a 16-man cavalcade. The delivery of the charter attracted a crowd of 12,000 people and set off three days of celebrations. The City has set aside $40,000 to fund 50th anniversary events. The first application deadline was Nov. 23. A second application receipt deadline is Feb. 1.